Standard Rod Length is 12″, which is measured from the center of the flush bolt body to the bolt tip. Optional rod lengths available for top bolt only on non-fire rated openings—18″, 24″, 36″ and 48″. FB33 Model with Auxillary Fire Latch eliminates the bottom bolt and includes a retrofit plate to cover existing bottom bolt prep. UL Listed for Fire Doors. 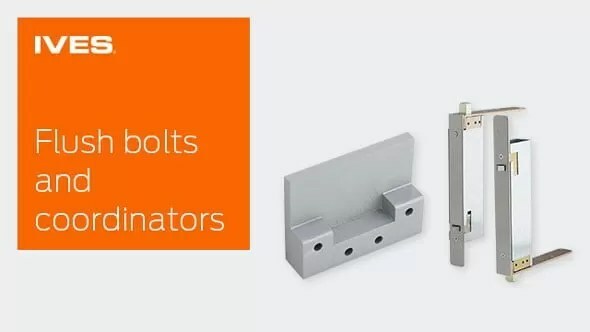 Constant Latching—inactive door remains latched until the active door is opened, releasing the automatic bottom bolt and then the top bolt can be manually released. Inactive door will relatch automatically when closed. FB53 Model with Auxiliary Fire Latch eliminates the bottom bolt and includes a retrofit plate to cover existing bottom bolt prep. UL Listed for Fire Doors. Constant Latching—inactive door remains latched until the active door is opened, releasing the automatic bottom bolt and then the top bolt can be manually released. Inactive door will relatch automatically when door closes. Double action spring design provides automatic holding of brass bolt in projected or retracted position, and assures ease of operation in conjunction with deep cup finger hole. Standard Rod Length is 12″, which is measured from the center of the flush bolt body to the bolt tip. Optional rod lengths available – 6″, 9″, 18″ and 24″ for fire rated doors. Optional rod lengths available – 6″, 9″, 18″, 24″, 30″, 36″ and 48″ for non-fire rated doors.